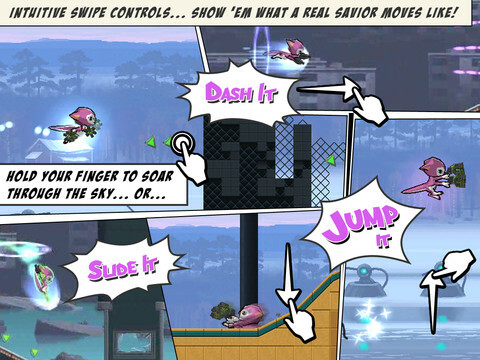 Canabalt popularized running games, but NCsoft's adventure takes them to new heights. It seems like everyone has an iOS game, and these days, many of them are runners, apps where you're put in control of a constantly moving character that can jump and that's about it. Not a terrible sub-genre, but one that's quickly grown stale, so it's great to see NCsoft 's Project 83113, a runner with a surprising amount of depth. It begins with the plot, which is everything but paper-thin. The developers at Fabrication Games put some thought into it, and in the process, created attractive 2D slides that tell the story of a rebellion against a tyrannical group of machines, and mankind's only hope, a four-armed creature named Belle, setting off on a dangerous quest to squash those maniacal robots; you can even pick up cassettes within the environments that provide additional layers to the narrative. Most importantly, Project 83113 feels more like a platform adventure than a Canabalt rip-off, largely because you have a superior level of control over Belle. Yes, the character pushes onward, but only when you want it to. Not only can you stop Belle by pressing and holding the screen, but you can also change direction and move left; this proves useful in gathering collectibles you missed. What's more, you're free to slide underneath objects, double jump across others, shoot enemies by tapping them and even wall jump to reach high areas. 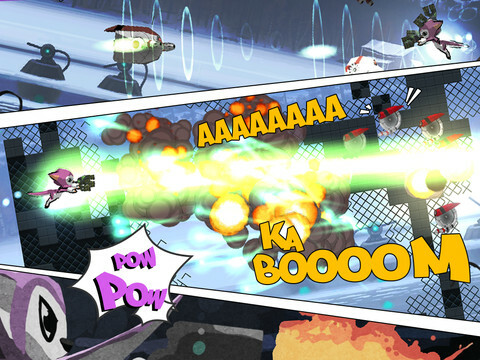 Meanwhile, the game features a satisfying number of bad guys to destroy, weapons to upgrade (there's one called Collateral Damage) and screen-clearing bombs. Dig a bit, and you'll find in-app purchases, but the creators were smart to make IAP unobtrusive. Bottom line, you don't need to spend more than $0.99 (the game's current price) to enjoy it. The real hook, though, involves running through the levels as quickly as possible to climb the Game Center leaderboards. No easy feat, since you'll navigate Belle through laser beams, buzz saws, swarms of droids, past crumbling platforms and other hazards where one slip-up usually results in death. There's a health bar, but as you'll soon discover, keeping it topped off proves tricky. That said, Project 83113 still doesn't have enough meat on its virtual bones. It won't take long to plow through all four worlds, and unless you're addicted to Game Center or driven by obtaining all three medals per stage, there's little reason to come back; we hope NCsoft has future updates in the works. Finally, and unless we missed it, there's no shield in the game to block incoming fire. Instead, the developers force you to shoot first and/or dodge. Some sort of blocking mechanic (at the expense of losing time during a speed run, of course) would help. Neither of these issues, though, break Project 83113. On the contrary, it's the most complex runner we've played, and makes us excited for the future of App Store platformers. To that end, we hope this isn't the last we've seen of Belle, or Fabrication Games, for that matter. What's Hot: Advanced controls let you dash and double jump with ease, tricky levels, Game Center leaderboards and achievements, entertaining plot, cool 2D artwork. What's Not: No shield to block incoming fire, too short.